BakeRender is a user interface for Rhino Version 4.0 that automatically creates baking ready *.rib (RenderMan Interface Bytestream) files with the help of RhinoAIR and the AIR Rendering engine from SiTex Graphics. Generated rib files are passed to BakeAIR for texture and lightning baker for baking. Resulting (baked) textures are assigned to their geometry in Rhino. 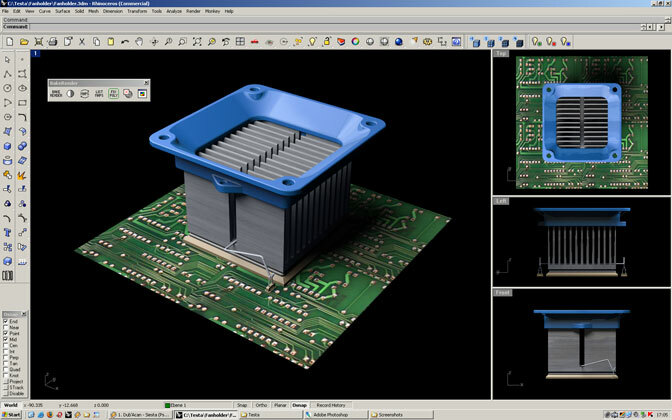 They can be viewed in realtime using the BakeRender display mode which is provided with this plug-in. Scenes baked with BakeRender can be used for realtime presentations, (faster) re-rendering with AIR and other renderers which support textures assigned through Rhino's standard material assignment dialogs. Any scene (with materials) which can be rendered with AIR from within Rhino 4 and the RhinoAIR plug-in can be used for baking with this toolset. The BakeRender toolset and documentation are protected under International Copyright Laws. Distribution by any means without express written consent of the author is forbidden. This software is provided As Is. The author accepts no liability or responsibility for damages in any form, regardless of cause. By using this software, you agree to the terms stated here and within the accompanying documentation. 1. Extract the contents of the BakeRenderV2.zip file anywhere. Make sure to preserve the folder structure. 2. Open Rhino, drag the extracted BakeRender.rhp plug-in file over the Rhino window to register it. The BakeRender tools are now installed and are ready to use. A help document named help.htm is included with the downloadable archive. You can also open the helpfile by right-clicking on the BakeRender button in the toolbar. Or you can access it from the opened user interface by clicking on the help button. If you're starting now with the BakeRender toolset, look at the Quickstart section in the helpfile. Info: Scenes shown below are baked with BakeAir by SiTex Graphics. 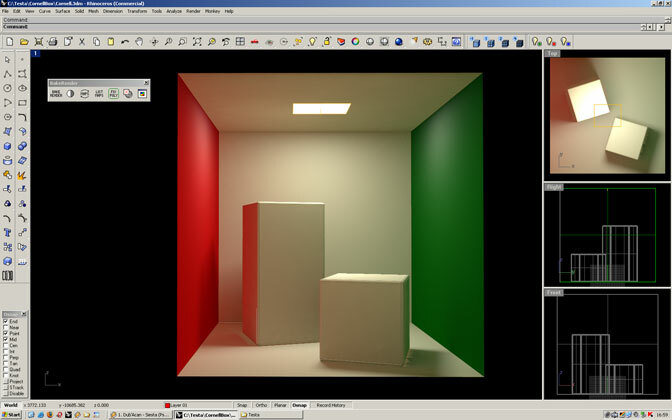 The AIR renderer was used to setup and preview materials and lightning. 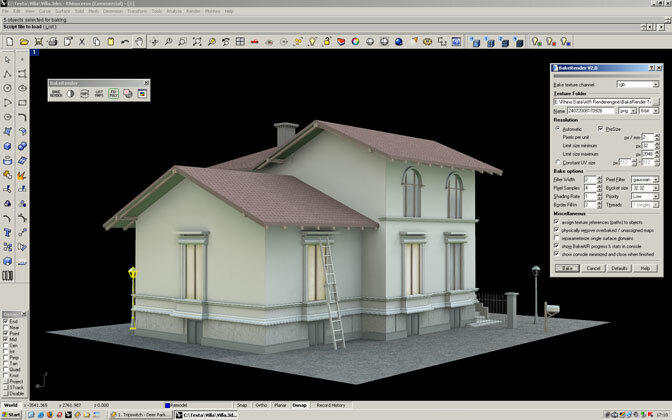 Note that you need Rhino 4 to preview these examples as Rhino 5 uses a new mesher which does rebuild the render meshes and therefore destroys the texture mapping information. Parts of the first BakeRender scene, created in 2005. It used 510 textures (one per surface) reduced to 66 maps (one per object) by using Rhino's packed texture coordinates for Polysurfaces. A default gamma of 1.0 was used for baking to export the final scene into a famous game editor. Most of the materials are free darktree shaders. Click on the image for a larger version. A simple scene of a Northbridge fan adapter with high resolution textures. Lightning of one arealight and ambient occlusion has been baked into textures and can be viewed in Rhino`s realtime display. Click on the image for a larger version. The famous cornell box scene baked with indirect light and one arealight. Click on the image for a larger version. Architectural example scene with 300 baked textures. Ambient occlusion and the light of several arealights together with procedural darktree shaders have been baked. Click on the image for a larger version. The scenes shown above can be downloaded with their textures to be viewed inside Rhino 4. To view the examples scenes properly, please download and install the display mode for Rhino 4 first! Note: You cannot view these scenes without installing the BakeRender display mode. Rhino 4 is required, do not attempt to view the examples with Rhino 5. 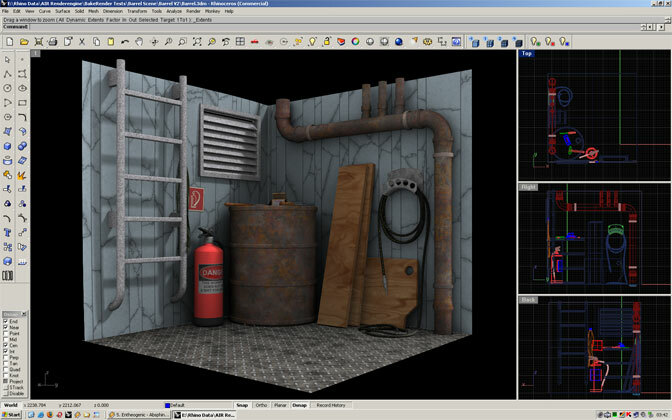 The BakeRender toolset and documentation is ©(Copyright) 2005-2009 Clement Greiner CG3D. All rights reserved. AIR, BakeAIR, the RhinoAir plug-in for Rhinoceros® and the Visual Shading and Lightning Tool Kit software and documentation are Copyright (2000.2008) SiTex Graphics, Inc. All rights reserved. Rhinoceros® (Rhino) is Copyright 1993-2008 Robert McNeel & Associates. All rights reserved. The RenderMan® Interface Procedures and RIB Protocoll are Copyright 1988, 1989, Pixar. All rights reserved. Go back to my script page.